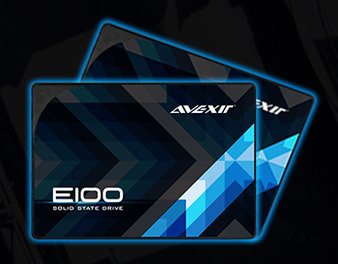 The Taiwanese company Avexir, which is best known for its high-end LED-equipped memory modules, has announced the E100 family of solid-state drives. They come in the common 2.5-inch form factor and offer three capacities – 120 GB, 240 GB and 480 GB. The new Avexir E100 solid-state drives are built on 15 nm Toshiba TLC NAND flash memory but unfortunately the controller behind the memory is unknown. The drives support the latest SATA 3.0 standard and offer variable read and write speeds. The 120 GB model reaches 495 MB/sec of read speed and 385 MB/sec of write speed, while the 240 GB model is faster at 515 MB/sec and 475 MB/sec, respectively. The 480 GB model reads at 520 MB/sec and writes at 480 MB/sec. The new SSDs support TRIM and undergo rigorous testing before being shipped. All new Avexir E100 SSDs come with a 3-year warranty. Unfortunately the prices of the new solid-state drives are unknown.